The GSGB September Meeting was held over two of Yorkshire's finest courses, Moortown on day 1 and Bradford on day 2. 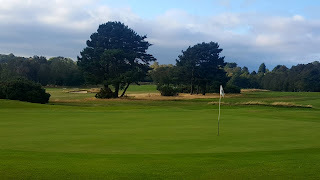 Host of the 1929 Ryder Cup, Moortown has a proud and interesting history and asone of the most attractive heathland courses in the land it is always ranked amongst the Top 100 courses in England. The Fifty four members who participated enjoyed light winds and plenty of sunshine, particularly at Bradford, but more importantly two days of dry weather to round off another enjoyable season for the Society. After Dinner we were joined by the Moortown Captain Malcolm Slinger ,who spoke of the club's junior programme before GSGB Chairman Giles Hinchcliffe presented him with a £500 donation towards the club junior section. The Bradford golf course is an undulating Harry Colt parkland design with tree lined fairways, excellent greens and some fine views. Improvements to the clubhouse were very noticeable since our previous visit and Bradford now makes an excellent venue both on and off the golf course. The men’s Barlow Seniors Trophy was won by Alan Percival from Astbury with 73 points and the runner-up was Ian Chamberlain from Frinton with 68points. The Ladies Trophy was won by Gillian Curley from Northamptonshire County who scored 61 points and the runner-up was Yogi Jackson with 65 points who had to settle for 2nd place as she is too young to take home the Senior Trophy. A full list of all prize winners can be seen below. Photos of the prizewinners and a group photo can be viewed here. The next GSGB event is the February tour to South Africa and the 2019 fixtures can be found on the home page of the website.